ADDCO METAL began primarily as a refinisher of fine architectural metals, such as bronze and stainless steel. We know a lot about surface preparation. In fact, surface preparation is as much as 95% of the time required to refinish a bronze revolving door. 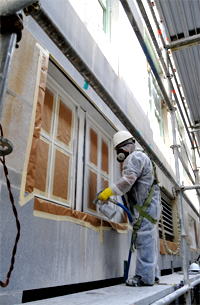 Paint manufacturers also know a lot about surface preparation. They know that the performance of their coating on exterior metal is directly linked to the preparation required prior to painting. That is why, beginning four decades ago, major paint manufacturers actively sought out metal refinishers like ourselves. Having developed a new generation of expensive high performance flouripolymer paints with extended twenty year warranties, they needed to be sure that the coating applicators fully understood surface preparation. 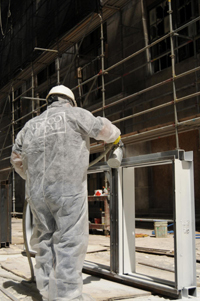 ADDCO METAL is a coating applicator and metal refinisher that has extensive experience in the preparation and application of a wide range of high performance architectural coating. Call us for an estimate for your next painting project, from small storefronts to entire curtain walls.